My final guest post this week comes from Emma at Science Sparks. Science Sparks is one of my ‘Must Go To’ blogs and I highly recommend that you pop over there for a root around once you have finished reading this post! Today Emma is making toffee apples and popping a bit of science in for good measure! Hello, I’m Emma from Science Sparks and I’m very excited to be guest posting on Thinly Spread today. Science Sparks is a blog full of fun and easy science based activities for young children, so please come and take a look around if you haven’t already. Autumn is my favourite time of year, I actually quite like it when the nights start to draw in, when outside is cold but inside is cosy and warm. Two of the things from my childhood I associate most with this time of year are toffee apples and treacle toffee, both of which are great for demonstrating changes of state. Please be careful when cooking toffee apples as the sugar needs to get very hot! 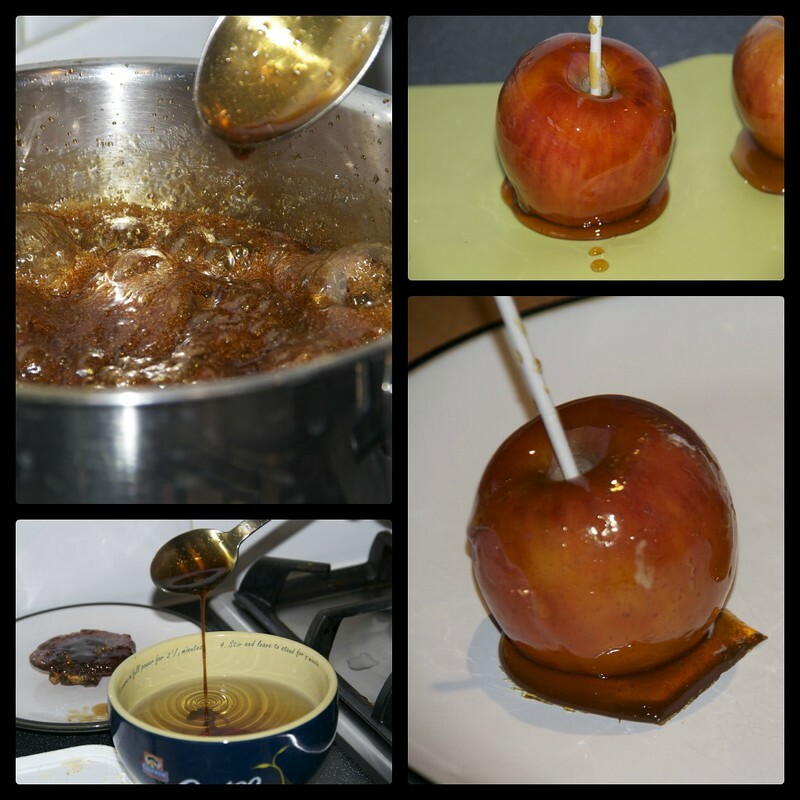 Cover the apples with boiling water for a few minutes, this removes the waxy coating so the toffee will stick better. Dry the apples, remove the stalks and push a lollypop stick or wooden skewer into the apple. Add the sugar and 50ml of water to a pan and heat for about 5 minutes stirring gently. The sugar will melt and the two liquids combine. Stir in the vinegar and syrup. If you have a cooking thermometer ( we didn’t ) boil the sugar mixture to 146 C. This is called the ‘hard crack‘ stage. You can test whether the sugar is at the correct temperature by dropping a little into a bowl of cold water. If the toffee hardens immediately and can be snapped when removed it is ready. Very carefully pour the toffee over each apple and leave to harden on a non stick mat or baking parchment. What do you think of our apples? As we made the apples I showed the children the sugar in its solid state and asked them how they thought we could melt it. My 4 year old wanted to leave it out in the sun, but we decided heating on the hob might be faster. Once the apples had been dipped in the toffee I asked the children what they thought would happen as the toffee cooled down. When the sugar and water solution reaches the hard crack stage there is almost no water left. This is the temperature lollipops and toffee are heated to. At lower temperatures softer candies are made. Watch out for a whole host of candy themed experiments coming soon on Science Sparks. Oh thank you, that’s lovely to hear! You’ve made my day ?